Health Product Declarations (HPDs) are one type of transparency report to help your customer understand your commitment to healthy materials and sustainable chemistry. You can create HPDs using Toxnot or the Health Product Declaration Collaborative's Builder. You can also import your Toxnot data to the Builder, or export your data from the HPDC Builder to Toxnot. 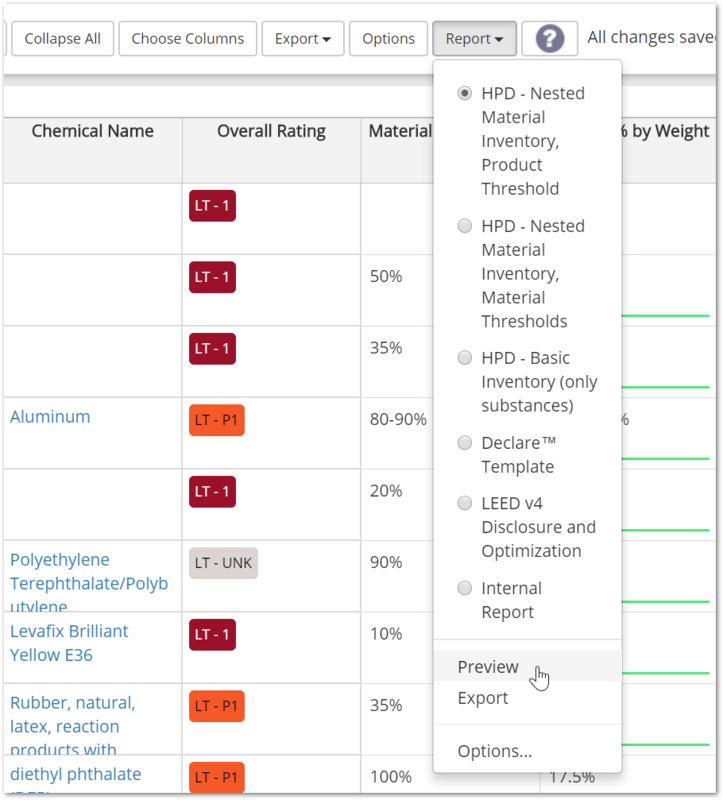 The Nested Material Inventory reports order substances by your level-one materials, and differ in how the threshold for substance inclusion is determined. The Basic Inventory report simply orders all substances by product, and does not consider materials. The header of the HPD document includes your product's name and description. Classification is configured in the BOM - General Summary Data as CSI Division. Product Description is configured in the BOM - General Summary Data as General Description. Inventory Reporting Format and Threshold Disclosed Per are determined based on the type of HPD report you choose. For Basic Inventory reports, use the "Residuals and Impurities Notes" field in the Summary Data. If the field is not empty, then the HPD will say "Residuals and Impurities were considered." Otherwise it will say "Residuals and impurities were not considered." The notes themselves will show up under the Product summary rows in Section 2. For Nested Materials reports, use the "Residuals and Impurities Notes" column in the BOM editor, and fill it out for any relevant material rows. The HPD will say that residuals and impurities were considered in "M of N materials," where M is the number of materials with non-empty Residuals and Impurities Notes columns, and N is the total number of materials in the report. The notes themselves will show up in the Material data in Section 2. For Basic Inventory and Nested - Product Threshold reports, your threshold for including a substance is configured in your BOM - General Summary Data as Reporting Cutoff (ppm). For Nested - Material Threshold reports, your threshold for including a substance is defined per-material in the Threshold column of your BOM. Substance Notes can be added in the Notes column of your substances. Notes will automatically be combined for rows with the same substance. Proprietary Data is included in the HPD report as "Undisclosed" for both the substance name and CASRN.